If you want to find out what has led the Republican Party to the electoral cliff it faces in 2018, you have to look no further than the so-called conservative media which has abandoned any attempt at objectivity to spout pro-Trump alternative facts. On Trump TV, aka Fox News, the President had a tremendously successful first year and the Republican Party is heading to a tremendous victory in next year's mid-term elections. Back in the real world, neither assertion is remotely true. That is precisely where we Republicans are. We are being told by conservative news outlets, people like Fox News, Breitbart, Rush Limbaugh, Sean Hannity, Lou Dobbs, Laura Ingram, that everything is just hunky dory, no reason for alarm. As a result, we Republicans delay the hard work of rebuilding the party and continue down a losing path that makes my party's fate much worse. We conservatives need to be told the truth about what awaits the party when we chose to tie conservative ideas to Trumpism. Unfortunately, Trump TV, like its namesake, has no interest in the truth. Gingrich and company act like it is new that reporters lean to the left (more than 80% of journalists regularly vote for Democratic Presidential candidates) and that liberal bias inevitably leaks over into coverage. We conservatives have known that for about 60 years. That does not mean conservatives should attack the American institution of a free press. It means conservatives learn to play the game, use the media's other multitude of biases (bias for action, bias for conflict, for example) to earn favorable coverage. Ronald Reagan, aka The Great Communicator, understood this. Trump does not not. Trump and his minions have instead chosen to whine about negative coverage and attack the legitimacy of our most important democratic institution - a free press. But, I digress. Gingrich's piece simply assumes that the word about the great tax bill will get out to the people despite the liberal media, apparently by political ads pushed by Republicans and conservative groups. There is no evidence to support this whatsoever. Here is the fact that people like Trump and his minions on Trump TV ignore. What has traditionally driven polling numbers is the economy. 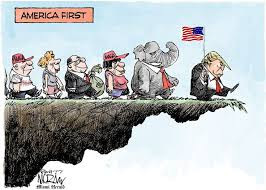 Yet, despite the economy is already growing at a brisk pace and the stock market is soaring to new heights, Trump as a record low favorability rating and the GOP trails by double figures on the congressional generic ballot. What does that tell you? It tells you that the performance of the economy is irrelevant to bailing out the GOP. The Trump brand of politics, with its hate and divisiveness, is toxic to the Republican Party. Many of those of us who opposed Trump knew he would for at least a generation stain conservative ideas, leading to a liberal resurgence. That is what is about to hit the Republican Party in 2018. Trump's win in 2016 will come at a terrible, terrible cost, especially for Republicans who choose to shed their integrity to warmly embrace the Trump brand of politics. 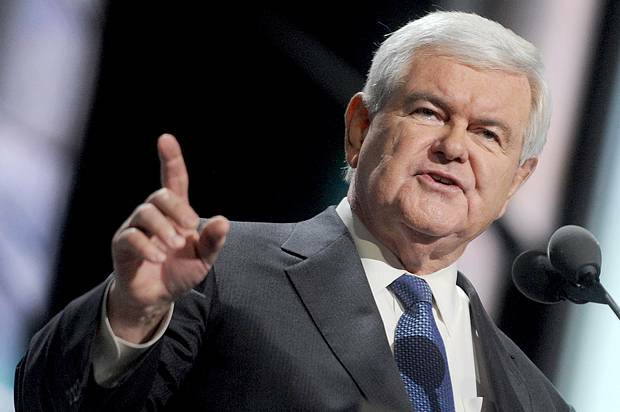 Conservatives can retreat to TrumpTV to hear people like Gingrich spin alternative facts, but that will not change the truth of what awaits the Republicans in 2018. Some Republicans, myself included, warned about the disaster that would await the GOP if the party nominated Donald Trump, a man we said was completely unfit to be elected President. And while we naysayers have been proven spectacularly right about Trump's ignorance and lack of basic competence for the position he holds, it is the President's foul and intemperate personality which has turned out to be the the most damaging to the GOP brand. Trump is turning my Republican Party into the party of assholes and the public doesn't like to vote for assholes. The number of people identifying Republicans has dropped 5% since Trump's inauguration. But that number is not nearly as bad as some of those that came out of the Alabama Senate special election won by Democrat Doug Jones over Republican Roy Moore, a candidate who embodies Trumpism and who was enthusiastically supported by the President. Chris Cizilla of CNN breaks down points to eight different sets of stats from the Republican's loss in heavily GOP Alabama, numbers that should trouble any Republican concerned about the future of the Party. They are summarized as follows. --Moore won voters over 65 by 19%. Among voters 18-64 he lost by 8%. Those older voters which support Trump/Moore style politicians are dying off and being replaced by younger voters who don't like the Trump brand of politics. 2. Women with children voted by Jones. --Women with children vote for Jones 65-32, while Jones won women without children by a closer 55-45 margin. In the past, it is women without children that the GOP has struggled with while the party pretty much breaks even with married children. --Self-identified moderates voted for Jones 74-25. This is the same state that has shown up in Trump's post-election poll numbers. The independents that propelled him over the top seem to have long ago jumped off the Trump train. --Trump won Alabama by 28 points. But among Tuesday's voters, Trump's approval rate was 48% while his disapproval rate was 48%. Moore wasn't just unpopular among Alabama's special election voters, so too was the President. --While everyone expected that Moore would win with Alabama "values voters," Jones won them 48-46. --in the last several election cycles, including 2016, Alabama has been one of the most Republican states in the country. Yet on Tuesday those Alabama voters told pollsters they approved of the Democratic Party more than the GOP by 47-43. 7. Republicans strength is increasingly confined to rural areas. --In cities of 50,000 or more, Jones won by an outstanding 71%. Traditionally, Republicans made back up ground in highly populated suburbs. But Moore only beat Jones 51-47 in Alabama suburbs. Moore did win the rural areas of Alabama 62-36, but being rural those areas have much less vote. --In 2012, 28% of the voters in Alabama were black. That was a record high, not surprisingly since the first African-American President was running for re-election. Yet that record was broken on Tuesday when black voters made up 29% of the Alabama electorate. That so many African-Americans would turn out for a special election is astonishing. Oh, and they voted 96-4 for Jones. Many Republicans, including me, have warned about the political cliff the Trump train is heading toward. You'd have to be blind not to see that cliff in the Alabama election results. 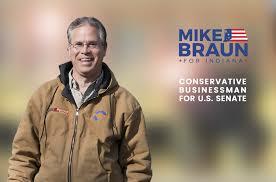 INDIANAPOLIS — A wealthy Indiana Senate candidate who bills himself in television ads as a conservative Republican voted for more than a decade as a Democrat in the state's primary elections, according to public documents obtained by the Associated Press. Records from the Dubois County Clerk's office, where candidate Mike Braun is registered to vote, show the 63-year-old consistently cast Democratic ballots until 2012. That could spell trouble for Braun, a businessman and former state lawmaker who elbowed his way into the competitive GOP Senate primary by investing more than $800,000 of his own money. In recent years, such races have been Republican purity competitions; next May's election determining who will face Democrat Joe Donnelly in the fall appears to be no exception. Supposedly Braun only voted in the Democratic Party because he wanted to play a role in which candidate that party nominated. This cross-over strategy that is sometimes employed in counties where there is one party control and whichever candidate that party nominated would be the one elected. Even if this were a valid reason for choosing not to participate in the Republican Primary (it is not), the fact remains that southern Indiana, including Jasper where Braun is from, hasn't been solid Democratic territory for at least 20 years. Braun voted Democrat up until 2012. While Braun's voting history should preclude his nomination as a Republican, the fact is another GOP candidate did not join the party until 2011 and he, Donald Trump, was elected President. Of course, that hasn't exactly turned out well for Republicans.